Free printed copies of BTB are available at Middletown Thrall Library. Check out our Booklovers Web Guide for sites especially helpful to readers: book clubs, reading groups, book discussions, reviews, reading advisories, publishers, bookstores, and more! Keep up with forthcoming titles and new authors by visiting our Booklovers Blog. Looking for something "good" to read? Or is there a book you really like and want to tell others about? Check out Thrall's own free RAVES! service for readers. Have you tried Novelist Plus yet? Find books and authors based on ones you like. Login using your Thrall Library card. Looking for suggestions? Stop by our Readers' Advisory Center by Reference or ask a librarian for recommendations on what you might like to read next. Also check out our Random Reads and Random GREATS pages for random popular and awarded titles, authors, as well as topics you might find interesting. Click here to view current bestseller lists and other award-winning books. Booklovers Web Guide - Websites, forthcoming titles, book reviews, reading advisories, and more! Also check out our blog and "Booklover's Lane" on our home page. eBooks / eAudio / eVideos - Freely download books, audio eBooks, and videos at home! Please be sure to log into the eBooks catalog to search and see all Thrall's offerings! Future Title Watch - View monthly lists of notable new titles and future bestsellers! Novelist Database - Locate books and authors based on ones you like. Reader's Advisory Center - Visit our Reference Department and enjoy specialized guides designed to help you locate books and authors you might enjoy reading. Random Greats! - Explore randomly selected awarded books and authors! RAVES! for Readers - Discover fresh and different books and authors, suggest titles to other readers, and comment on books. You can also quickly check if a book is available in the library catalog! Reading Plans - Members of Middletown Thrall Library can request their very own reading plans for free. Tell us what you like to read, and we will present reading suggestions tailored to your tastes! Virtual NewsStand - Enjoy easy access to magazine articles and more on the Web. Virtual Reference Library - History, culture, religion, and more titles freely available online. 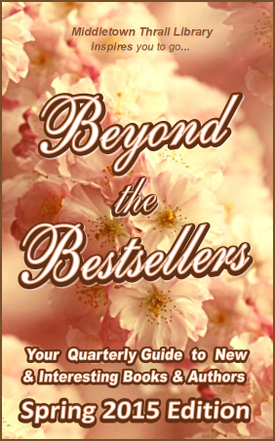 Beyond the Bestsellers highlights new and notable authors not often found on bestseller lists. Discover new books and writers you might enjoy! To learn more about a book and check on its availablity within the library system, please click or tap on its cover or title. You can also click / tap an author's name to locate any additional titles by that writer in the library catalog. The Room - Jonas Karlsson - While toiling away as a low-level bureaucrat at The Authority, Bjorn discovers a secret room only he can see. In entering the room, he becomes highly productive, resulting in workplace conflict and confusion. Part satire on the modern workplace, part psychological drama, it is never clear if the room really exists. Head of State - Andrew Marr - In 2017 as the UK awaits the decision on a referendum to leave the E.U., a well-kept political secret has a handful of political watchdogs stopping at nothing to uncover the conspiracy. A dark political satire that makes fun of the workings and not-workings of the political system. Barefoot Dogs - Antonio Ruiz-Camacho - A collection of interconnected short stories about a wealthy Mexico City family's unraveling after the disappearance of the patriarch, Jose Victoriano Arteaga. Each story is told by someone connected to the family, creating a compelling and tragic family saga that plays out as they come to terms with their loss. Jam on the Vine - LaShonda K. Barnett - For Ivoe Williams, a child of emancipated slaves in early 20th century Texas, reading is her escape, and she grows up to study journalism. Finding limited employment opportunities due to her race and gender, Ivoe moves to Kansas City with her lover to start a female-run, African American newspaper. Of Irish Blood - Mary Pat Kelly - In 1903, Nora Kelly leaves her Irish-American neighborhood in Chicago for Paris, in the wake of a disastrous love affair. In Paris, Nora finds herself in the world of high fashion, but through the people she meets at College des Irlandais, Nora becomes involved in the battle for Irish independence. Fiercombe Manor - Kate Riordan - In 1933, Alice Eveleigh, unmarried and pregnant, is sent from London to live at the quiet country estate Fiercome Manor. Maintained by a housekeeper since the family left years ago, it seems ideal, until Alice learns of eerie similarities between her and the previous lady of the house. The Strangler Vine - M.J. Carter - In 1837 Colonial India, Avery William, a young soldier for the East India Company and Jeremiah Blake, a secret political agent, are sent on a mission to find writer Xavier Mountstuart who has disappeared in dangerous Thugee bandit country. An adventurous mystery filled with details about life in colonial India. A Murder of Magpies - Judith Flanders - Book editor Samantha Clair finds herself immersed in an investigation when a string of crimes is connected to the fashion industry expose she is editing, including the disappearance of the book's author. Samantha joins forces with her mother and Inspector Field, to try and determine who wants the book stopped. New Uses for Old Boyfriends - Beth Kendrick - Lila Alders lost her father, her job, and her husband in short order so she returns to her hometown of Black Dog Bay, opens a vintage clothing store and tries to start over. While she re-purposes the clothes she sells and herself, she finds new love with an old friend. A Darker Shade of Magic - V.E. Schwab - In a world of parallel Londons, Kell is one of a select few that can travel between each world, bringing correspondence to the respective leaders. However, Kell's side job of smuggling artifacts between the London's creates havoc and Kell finds himself on the run trying to restore order. The Missing One - Lucy Atkins - After the loss of her mother and the discovery of her husband's affair, Kali MacKenzie flees with her son to Vancouver to try to learn more about her mother with whom she had a strained relationship. In her search, family secrets are revealed putting Kali and her son in danger. The Kind Worth Killing - Peter Swanson - While flying from London to Boston, Ted Severson meets the mysterious Lily Kintner, and their flirtatious encounter takes a dark and dangerous turn when Ted mentions he has caught his wife in an affair and Lily suggests that his wife might be the kind of person worth killing.